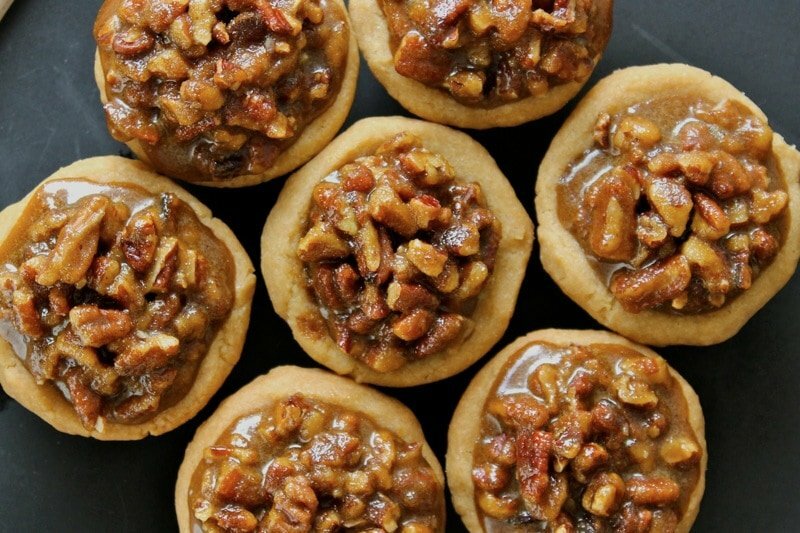 The crust is buttery, the filling is sweet and the pecans are plentiful in these delicious little bites of pecan pie! 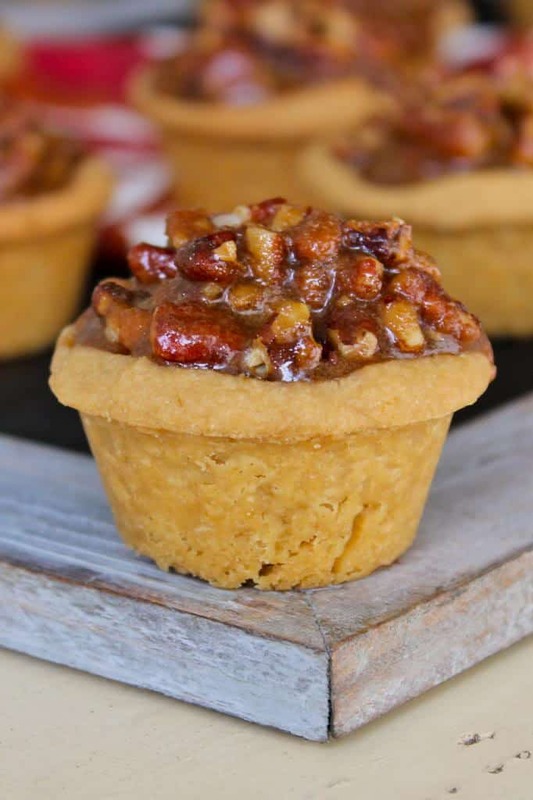 Thanksgiving is less than a week away and I’ve got the easiest and most delicious little bites of pecan pie that will have your loved ones begging for more and thanking you over and over again! They are perfect in every way! 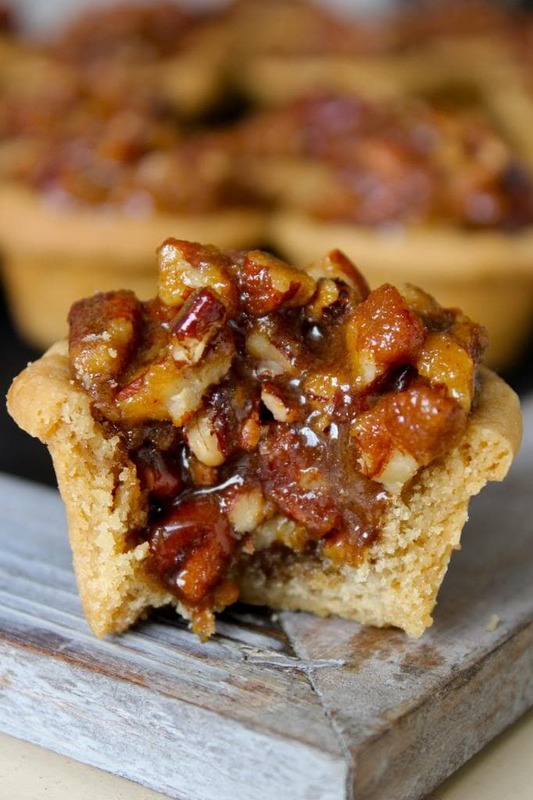 The crust is buttery, the filling is sweet and the pecans are plentiful! The perfect ending to a huge Thanksgiving feast or just a leftover turkey sandwich! 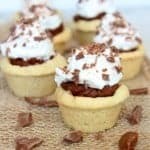 You’ll be thanking yourself for adding these to your Holiday menu because with little effort they are sure to be the stars of your dessert table! Fail-proof and fabulous! 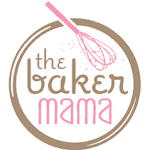 Let me show you how easy they are to bake! Let them set for about 5 minutes before topping each bite with another tablespoonful of filling. Let cool completely before removing from the pan! Pecan pie perfection! Y’all are gonna love ‘em! Preheat oven to 350°F. Lightly spray a mini muffin pan with cooking spray and set aside. In a large skillet, melt 2 tablespoons butter. Add the chopped pecans and toast for about 10 minutes until golden brown, stirring frequently. Meanwhile, make the crusts. 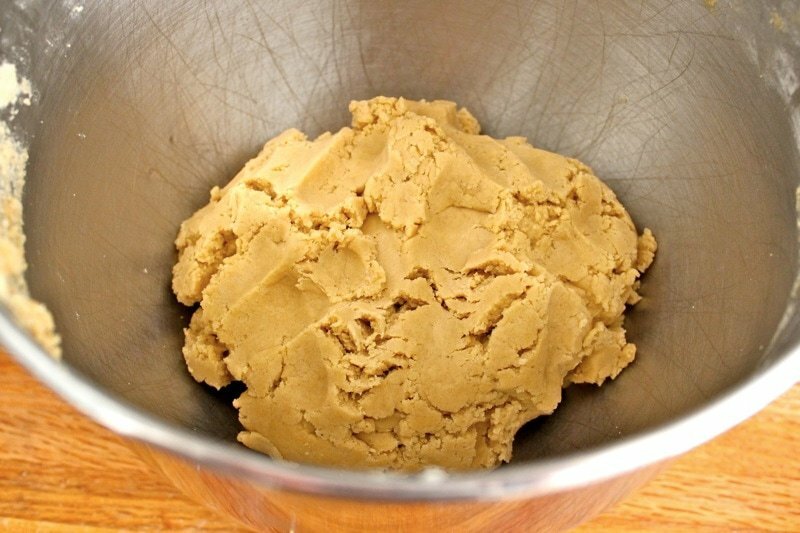 In the bowl of an electric mixer, beat the butter and brown sugar until creamy. Add the flour and salt and beat until well combined. 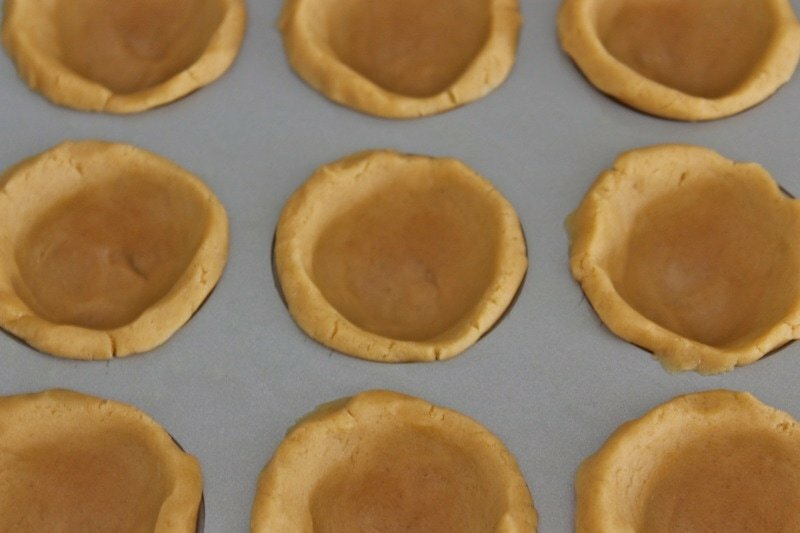 Take a few tablespoons of dough and press into and up the sides of each mini muffin cup. To make the filling, in a large bowl, stir together the brown sugar, light corn syrup, melted butter, and vanilla. 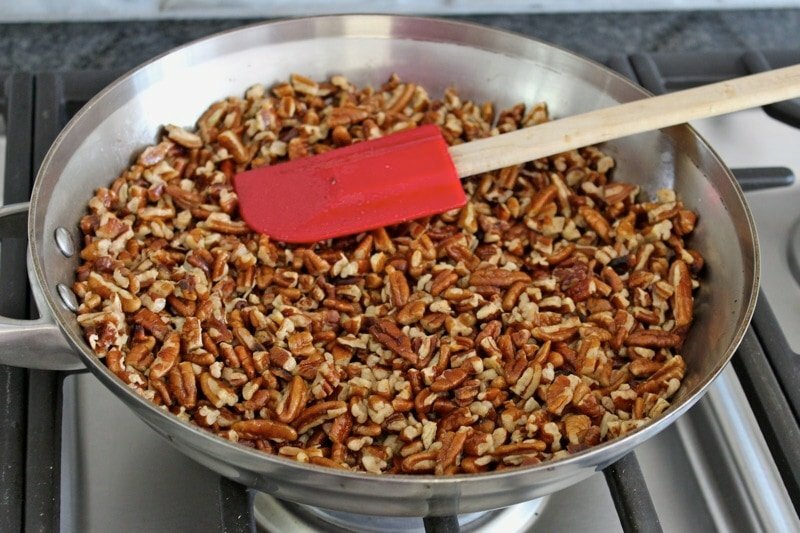 Stir in the toasted pecans until well coated. Spoon about a tablespoon of filling into each crust, filling it about ¾ full. 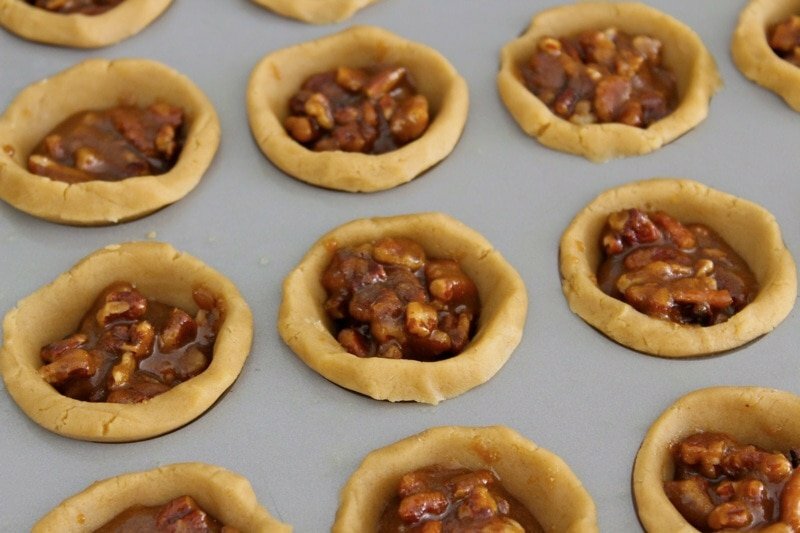 Try not to overfill the crusts, as the filling will bubble over when they are baking. Don’t worry...you'll be adding more filling after they bake! Bake the bites for about 15 minutes or until the crusts just start to brown. Remove from the oven and let set for about 5 minutes before scooping another tablespoon of filling onto each bite. Let bites cool in pan completely before removing. Hi Lynette! I think they would bake great in a regular-sized muffin pan. You’ll probably need to bake them a little longer and they may not overflow with filling, but there should still be plenty filling to fill 12 of them. I’ll have to try the larger size soon. Great idea! Enjoy! Thanks so much for getting back to me. Gonna be making these soon for a big church function. Wish me luck. Can I split the recipe in half? Can this great looking dessert be made the day before serving them? Absolutely! Just cover loosely with plastic wrap or foil and place them in the refrigerator. Enjoy! Hi Sharon! Yes! Make sure they’re cooled completely and place them in a parchment or foil-lined container that has a lid or that could be covered tightly in plastic wrap and foil. You want them to be as airtight as possible. 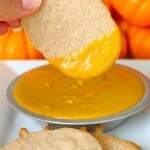 Once you’re ready to eat them, remove the lid or covering and let them come to room temperature. Hope this helps! Enjoy! About how long can they freeze for? I’m thinking of these for my sisters wedding. And the more I could do ahead of time the better. Hi Jen! They would freeze well for at least a month. Just let cool completely, remove from pan, wrap tightly in plastic wrap or store in an airtight freezer-safe container. Let thaw in the refrigerator overnight before serving. Congrats to your sister! Enjoy! OM! Can’t believe I ran across this recipe. Years ago when my dad was alive and working, his secretary made these or look-alikes every year for my family. 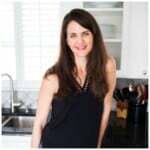 So happy to come across your blog and this recipe! Can I substitute the corn syrup with something else? Hi Milli! I’ve never tried it, but I searched around and you can replace 1 cup of light corn syrup with 1-1/4 cups granulated sugar dissolved in 1/4 cup hot water. You would need to adjust the measurements accordingly since this recipe just calls for 3/4 cup light corn syrup. Hope this helps! Enjoy! I am making these now…. does the filling have 4 tbls of butter? If do, why not melt all 4? My filling seems very dry. I hope they come out ok! Hi Lynn! 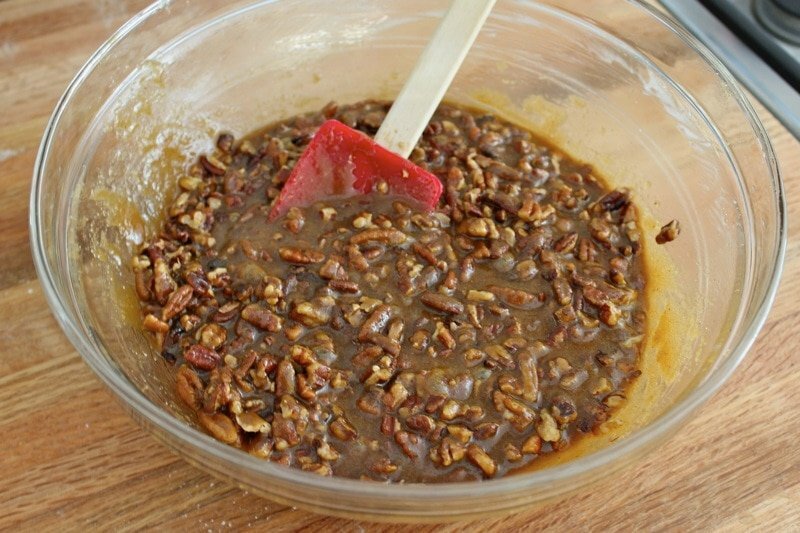 2 tablespoons are used to toast the pecans and the other 2 are mixed in the filling before you stir in the toasted pecans. The filling should be thick and gooey, but not dry. Hoping they turn out great for you! Enjoy! Omg! These look delicious. Getting the butter out as I type this! 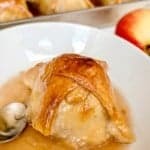 I’m confused about cooking a tablespoon of the filling in the crust and then adding another uncooked tablespoon after baking, is the consistency still the same of both? Or I’m I missing a step? They look wonderful anxious to try them. Hi Marsha! The tablespoon in the crust helps hold down and form the crust shape while it’s baking. If you put too much filling in the crust, it will bubble over while baking and you won’t be able to remove them from the pan. The filling is fabulous by itself, so I added more on top after they were baked because that’s the best part. 🙂 Enjoy! I just made these today and I have about a cup of filling left over. I am not going to throw it away because pecans are kind of expensive right now. I am thinking it could be used as an ice cream topping. The taste of these are amazing. What if I don’t have an electric mixer? What can I use? Hi Yvette! You could use a hand mixer, a wooden spoon or even your hands since the butter is soft. Hope this helps! Enjoy! These look fantastic. 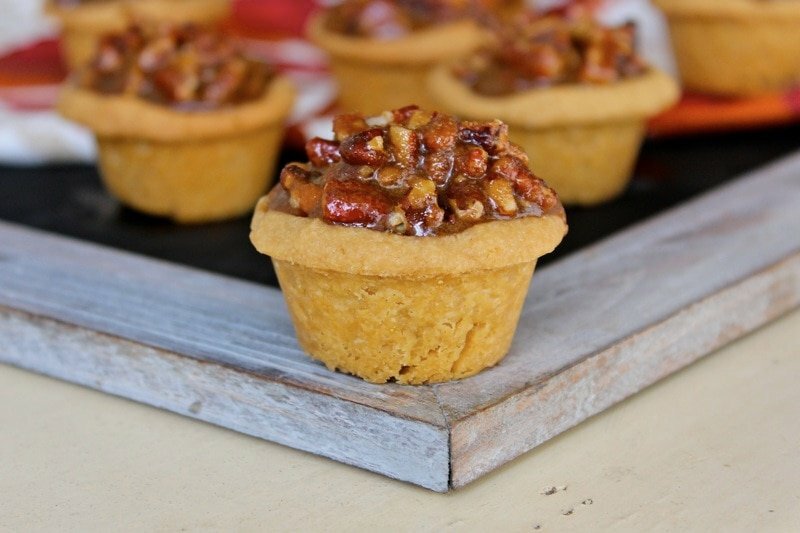 I’m hoping to make them but substituting corn syrup with cane syrup. My boyfriend’s family owns a sugar cane farm and harvests gallons and gallons of syrup every fall to have for the rest of the year. For valentine’s day I’m trying to incorporate their family syrup into as many recipes as I can. However, I’m short on time leading up to the 14th, so I’m trying to make as many items for the assortment ahead as I can. How many days do these keep for? When you add the extra tablespoon of filling do you place back in the oven to bake? If so how much longer? These look great. I have a dessert social next week and plan to try these. No. The filling doesn’t really have to be baked. The first tablespoon just holds the crust in place while it bakes. If you overfill the crust while it bakes, the filling will melt out and prevent you from being able to remove them from the pan. Enjoy! They will not stick to the muffin pan will they? I really do hate that. Hi Diana! If you make sure not to overfill them and be sure to let them cool completely in the pan before trying to remove them, they should come out just fine. You could always use mini liners for peace of mind. Enjoy! Is there a recipe for this using chocolate? 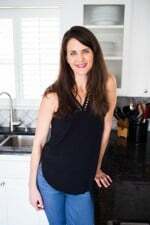 We love chocolate pecan pie, Wonder if chocolate chips and some sweetener or sugar would ruin the recipe?Don’t have the recipe for chocolate pecan pie or i would just try to adjust, to fit…. Hi Sue! I love chocolate pecan pie too! I’d have to play around with the recipe, but my initial try would be to reduce the brown sugar by 1/2 cup and add 1/2 cup chocolate chips to the filling instead. I’m definitely going to give it a try soon and I’ll let you know! Should the 1 1/2 cups of brown sugar be tightly packed? No, I just measure it like I would granulated sugar. Enjoy! These little nuggets of heaven are delicious and easy to make. I made the mistake of adding all crust ingredients at one time; I didn’t cream the butter and brown sugar first…oops. The crust turned out fine much like shortbread. I ended up with alot more filling than necessary, around one cup full. The presentation is impressive and these would make a great gift. A definite keeper. I just made these and all I can say is wow. They are the best tarts I have ever tasted, absolutely delicious . I might try maple syrup instead of corn syrup next time just for a change in flavour , but I don’t think anything could be better than these bites of heaven. No more butter tarts with fussy pastry for me. Hi ! Can I bake and freeze them ? Hi Loli! They should freeze great! 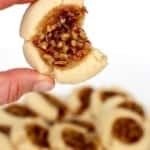 Just let them cool completely and wrap them individually in plastic wrap before placing them in a resealable baggie or sealed container in the freezer. Enjoy! I plan to make these for our fall Sunday school class gathering. They sound wonderful! When the last tablespoon of filing goes on top, does it set at up? Just wondering how messy they will be…although, messy can be good! Hi Donna! These would be so perfect for a Sunday school gathering. The extra filling on top sets up just the way you put it on there. They’re actually not as messy to eat as you would think. They’re the perfect size to hold in your hand and eat in a few bites or some like to eat them with a fork on a plate. Hope this helps. Enjoy! My crusts are a flop. They puffed up to much while baking. I poked holes in them before going into the oven. I am making a practice batch before the actual gathering. So glad I did. Suggestions? Maegan, years ago I was a great cook (at least my family said so)!! Never mind, I know what I did wrong with my crusts. If i do these in a regular cupcake pan, how long should I bake them for? Thanks ! Hi Corisa! I haven’t tried this recipe in a regular cupcake pan, but I’m guessing they’ll take 20-25 minutes. The crusts will be light brown and the filling will be bubbling. Followed the recipe exactly, but my filling was waay too thick. I added a beaten egg, filled and baked. Did not put filling on top after baking due to the raw egg, but they came out fantastic anyway. Best ever little pies! 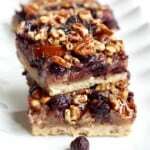 So much better than the old “Pecan Tassie” recipe I’ve used for years. Thanks for the recipe! I had a cold and was too lazy to do much so I wrapped the filling in pre-made crescent roll dough. Best improptu pecan rolls I ever had. Great comfort food for getting rid of a head cold. Thanks for sharing. Its really delicious. Try it soon. I know I’m late to the party, but my daughter has a tree nut allergy, so I always make faux pecan pie using a regular pecan pie recipe but using pretzels instead of pecans- seriously, so good. My husband requested one for a potluck at work, so I was gonna make this recipe instead of my usual. 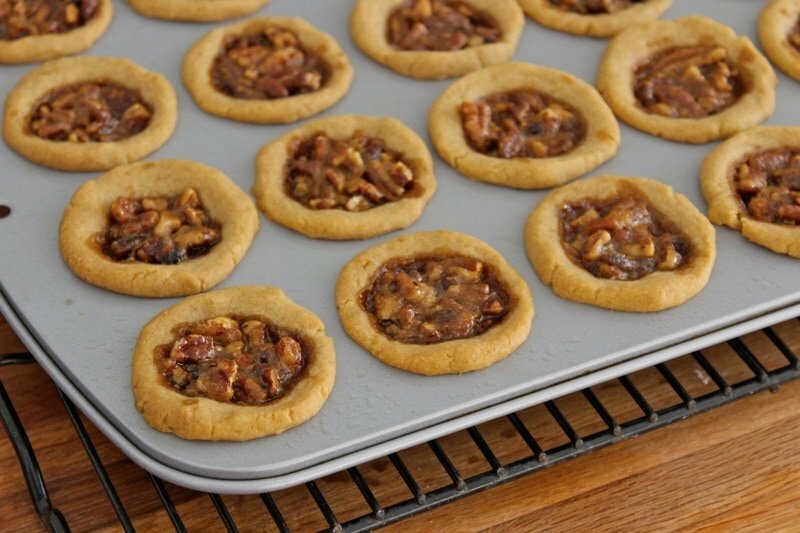 Since I don’t have to toast pecans, do I still need the butter that would usually be used in the roasting to keep the filling moist? Thanks! Hi Sasha! No, you would not need the 2 tablespoons butter to toast the pecans in that case. I hope they turn out great! Enjoy! I will be trying these tomorrow. 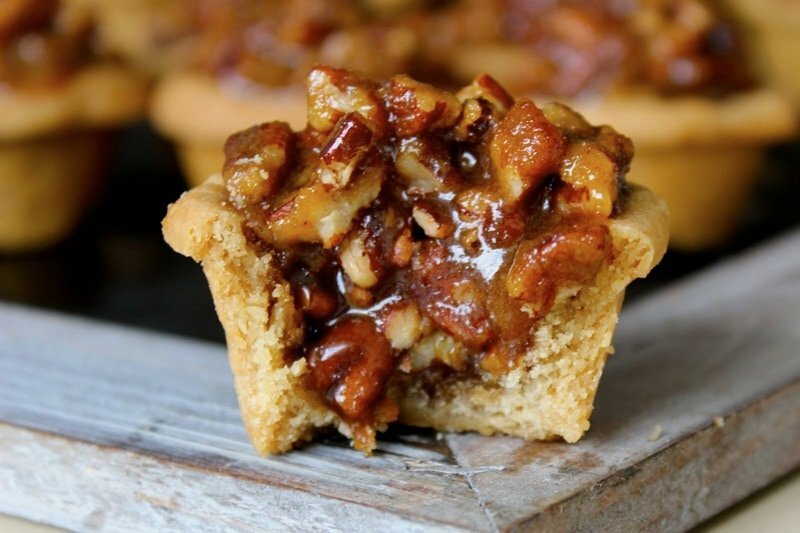 They look delicious and I love pecan pie!